Lenticular is a specialized printing process that shows depth or animation and can be used to tell the story of your brand or product. World3D can produce lenticular for your promotion, advertising, packaging and more. Lenticular printing increases impact. We’re here to help you make a great lenticular. We’ll talk with you about your goals for the image and provide feedback on your art. We’re here to help you make a great lenticular. Click here to learn about the basics of designing a great lentiuclar image. Welcome! 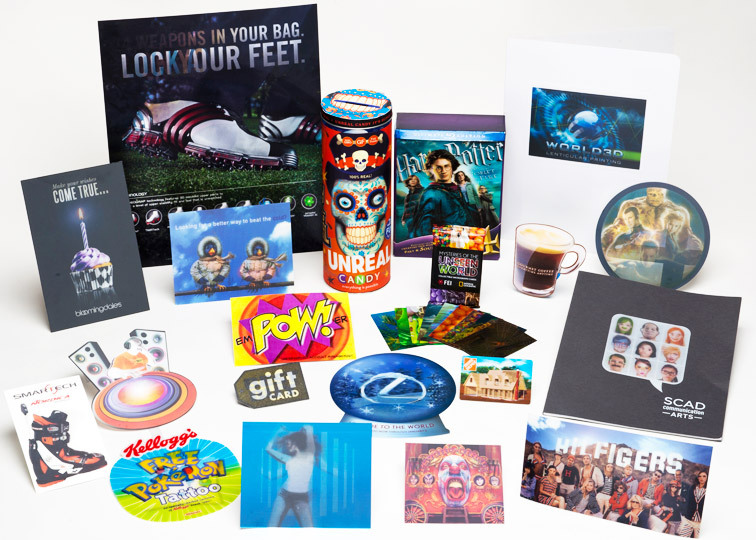 We’re here to help you learn more about lenticular printing and how World3D can make your project easy, affordable, and even fun. If you have questions about our services or if you would just like a sample pack, we invite you to pick up the phone and call us at (800) 743-1997. We’re here to help! "The team at World3D have consistently delivered quality results in our exploration of lenticular technologies. With an eye for detail, we have come to rely on their experience and knowledge to help us break new ground on our projects. World3D is a valued partner who always rise to the challenge." "The cards were a surprise hit and we are now in our third series of cards and they remain a highly requested item at various corporate events and also serve well as an educational outreach item. Working with World3D was like working with an in-house team; they worked closely with us and performed much of the “leg-work” to make the production process run like clockwork. We’re looking forward to producing the next series of lenticular cards!" "For over ten years, World3D has supplied the lenticular cards included in all of our lens packaging. They have consistently responded to our requirements and have produced quality product. Please convey our thanks and appreciation." "My experience working with World3D was a wonderful, very efficient and professional one. The project was on time, on budget, and my company was thrilled with the final result. I would use them again with no hesitation." "The guys at World3D are super great and have been so easy to work with for the decade that I’ve been using them. They always happily give me the best, easy to understand information that I can relay to my customers. My customers and I are always thrilled with the results!" "The team at World3D makes it very easy! They offer a unique product and are experts in their field. Our clients are always very happy with the final product. They are a trusted print partner." "World3D did a great job on my lenticular project. They got my project done on time and it looks great!"